I would like to explain to you now the importance of meditation, because meditation is the foundation for all spiritual growth and development, and without meditation, you can just skip it. You won’t get what you want in life, you won’t get psychic abilities or spiritual growth. The first part of meditation is prayer. Even if you never sit down in a chair and close your eyes and enter within, you still can enter alpha consciousness and awareness by prayer alone. And prayer you have done for thousands of years on this Earth and you still do, and that is why you sit in those chairs today. It is not because you have done overly much meditation – if you had done that you might not be here at all. But you have done a lot of prayer, and following prayer, contemplation. Prayer is talking either to God, to Christ, to the Teacher, to your Guru and ask for help for the Earth, help for yourself, and you can therefore by prayer alone invoke certain powers. It can be very powerful work, especially if you invoke the forces, in a prayer form, at meetings with three to five hundred people assembled at the time. In prayer meetings the numbers are very important. In meditation meetings one person alone can do it. But we don’t learn to meditate just like that, not because we want to – don’t ever believe that. Meditation is something that happens. It is a state of awareness, which happens after you have practiced for so and so long – but for how long is decided individually. I cannot tell you individually here, even if I might be able to see sort of time, that in five incarnations you will enter Nirvana* – that is impossible to say. But what I can promise you is that working with meditation properly from now on will get you into Samadhi state of consciousness before many lives have passed, because Samadhi state of consciousness is not very difficult to attain. Nirvana is hopeless, for Nirvana you have to meditate many lifetimes and be a very highly elevated soul. Why are we meditating? First of all, we are not starting to explain the bodies of man until later, but I can draw just quickly on the board that we have, as you all well know, Spirit body. ​In every human being your soul is a sun, a veritable sun. To start with very, very small, no colours, nothing, no rings of colour, which I will explain later on, but you have within you your Higher Self, it’s a sun, beautiful radiant sun. And this Spirit I am just drawing as a little point because the Spirit is so enormous it has no shape nor form. So I will just put it to be a point. And the energy from Spirit is entering the enormous soul which is a sun. 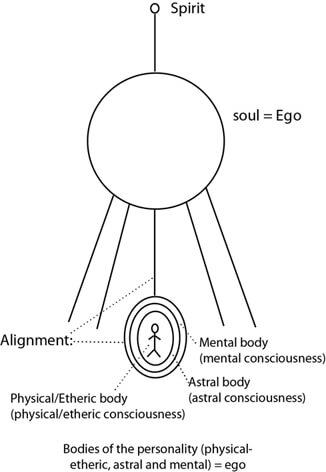 Soul is sending down onto one level of existence a personality starting with the mental body, astral, physical etheric – the mental body, the astral, the physical etheric, with this being the physical – little man inside. What meditation does is it gets you from the physical etheric consciousness, which you very easily have, because you are that consciousness always from birth, it gets you into an astral consciousness, it gets you into mental. Finally, through alignment of these bodies you reach into soul. What is meditation therefore creating? Alignment. Alignment is the keyword in every meditation. Alignment of what? Of the bodies of the personality with that of soul, and at a later stage with that of Spirit. You think it is easy to accomplish this alignment? No, no, it will take hundreds and hundreds of lives of spiritual work, prayer, contemplation and meditation in the end. Now - we are going to use terminology: this is the Ego, we call the Higher Self, the soul, a big E, and the personality is called the lower ego, the little ego. So what we strive to do in meditation is to combine the little ego and the higher Ego and transfer the consciousness of the higher Ego to the lower ego. So in the end what you achieve, you achieve soul consciousness. When the higher Ego has totally taken over the personality, when it happens you become nirvanic, the soul takes over the consciousness of the personality. But the interesting thing is that when you have the consciousness of the lower ego you are entering Samadhi, which is a much lower consciousness. Even with an astral consciousness or with mental consciousness, just the border of it, you can enter Samadhi. When you have aligned the inner bodies you are gaining a certain equilibrium, a certain balance and harmony. And this balance and harmony can later be disrupted by your Master, your Guru or your soul. See, on the way called spiritual development, we are working towards balance and harmony and we find it, but it is only for a period. Then we will enter a time of chaos and confusion, because then we grow. In a moment of balance there is no growth. The moment you reach peace of mind and balance in your inner bodies, the Master or your soul will send down an energy which will disrupt on purpose this balance, cast you into total confusion and chaos to grow to higher level of consciousness – it happens all the way. If you see a person who has a peace of mind and radiates lovely feelings, don’t believe for one second that person is soul aware – no, probably not. That person has reached into the astral level of consciousness and has found an astral peace, beautiful relaxed feelings, and it can remain like that for an entire lifetime, where it is in a perfect equilibrium. But the next lifetime the equilibrium is completely smashed to pieces, because the mental energy from the mental body is entering into the astral body and causing confusion. So what we see in meditation is, if we here have a human being, with physical etheric consciousness, the astral consciousness is the one we reach out for first. And we can go through many lives before we reach astral consciousness, and when we have reached it we are totally in balance – astral balance, purity of emotions for one life. Then, we start working ourselves into a mental balance and harmony. It takes many lives to get there and you achieve a lower mental balance and harmony. When you have achieved that you are to other people a super human being, you are on such a higher mental level, but you still are not soul conscious, you are still not what you need to be – a Master of perfect wisdom. Then, when we have aligned these bodies of the personality, we are then sending out a perfect unbroken link into the mighty soul and the mighty soul takes over. From that moment onwards we have no more to learn on this Earth, and that is what we are striving for people to understand: that even if you gain a certain peace and harmony, it is not the end, it is but the beginning. Because until you are soul conscious, you have as much to learn on any level of consciousness, on Earth especially.